Welcome to Diamond Records Wiki! This wiki is yet under progress as the game has entered Reversal and we are looking for editors. If you're looking for general information and a quick overview of the game, wish to learn the core mechanics, check the DR Wikia page. Looking for a JoJo's Stardust Shooters Wiki? Check this! 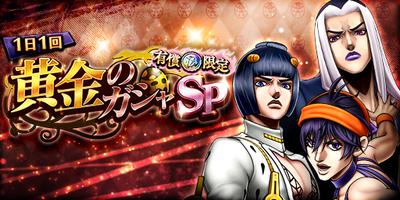 Latest Gasha - Statue Gasha "Super Advent Gasha Premium"
This page was last edited on 19 March 2019, at 02:27.